Zimbabwe on Sunday inaugurated a president for the second time in nine months as a country recently jubilant over the fall of longtime leader Robert Mugabe is now largely subdued by renewed harassment of the opposition and a bitterly disputed election. The 75-year-old Mnangagwa, who took power from his mentor Mugabe with the military's help in November , said "my door is open and my arms are outstretched" to main opposition leader Nelson Chamisa after the Constitutional Court on Friday rejected opposition claims of vote-rigging and upheld the president's narrow July 30 victory. "It is time to move forward together," said Mnangagwa, who has promised democratic and economic reforms after Mugabe's repressive 37-year rule. Chamisa on Saturday said he respectfully rejects the court ruling and called the inauguration "false." "They know they can't invite me to a wedding where I was the one supposed to be receiving the gifts," he said. His spokesman Nkululeko Sibanda on Sunday said "we haven't received any formal invitation." The 40-year-old Chamisa has called for dialogue with Mnangagwa but suggested that talks on power-sharing first must acknowledge the opposition leader's alleged victory. "You cannot steal my goats and then ask me to come and share them with you," he said. Ruling party spokesman Paul Mangwana criticized Chamisa for saying he will snub the inauguration. "It is important for nation-building at this critical time. The problem is the (Movement for Democratic Change party) did not give us a good opposition leader, they gave us a schoolboy, so he is playing schoolboy politics," Mangwana told The Associated Press. Upbeat supporters of the president and ruling ZANU-PF party filled the 60,000-seat National Sports Stadium in the capital, Harare. Some said they woke before dawn to catch buses and trucks in villages hundreds of kilometers away. The heads of state of South Africa, Congo, Rwanda and Zambia and elsewhere attended. Botswana's former leader Ian Khama, a sharp critic of Mugabe who attended Mnangagwa's first inauguration, skipped this time "due to prior commitments," Botswana's government said. Zimbabwe's economy is in a tailspin. 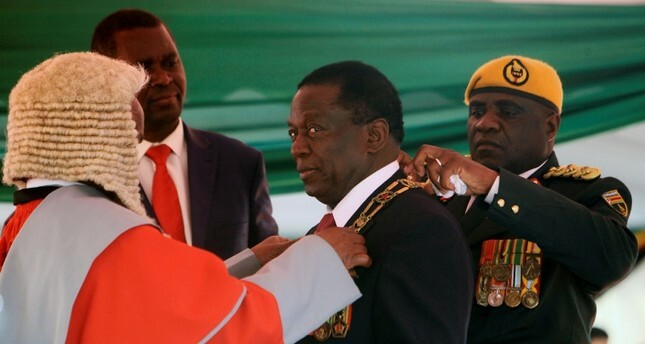 Analysts say Mnangagwa's immediate tasks in his five-year term should include solving severe cash shortages and high unemployment that has forced thousands of people into the streets as vendors. Millions of others have fled the country over the years. Final reports are pending from dozens of Western election observers invited for the first time in nearly two decades. Observers noted few issues on a peaceful election day but expressed concern about "excessive use of force" two days later, when six people were killed as the military swept into the capital to disperse protests. "We are saying to you ... we have at last found a man who can make our small nation a great nation. Please help him."